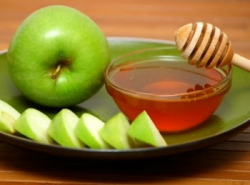 As Rosh Hashanah approaches, all we can think about are apples and honey! Bread and cheese make everything better! Recipe here. Move over beignets! There’s a new fried dessert in town. Recipe here. Temperatures may not be dropping, but fall is approaching! Kick off the new season with a crisp. Recipe here. Figs are also customarily eaten to celebrate the start of a sweet new year. Recipe here. This is cake you can eat for breakfast! Anything made with fruit is healthy, right? Recipe here. Share any of these dishes at Rosh Hashanah dinner or Yom Kippur break fast and you are sure to delight the crowd! May these recipes help usher in a Shana Tovah Umetukah - a “good and sweet year” for you and yours.